12 Person passenger vans are a great asset for conveniently transporting groups of individuals, whether it is for a large family vacation or a high school competition. Most car rental companies, including Alamo, Budget, and Avis, all offer 12 passenger van rentals. Common models for the vehicle include the Ford Transit Wagon, NV Passenger Van, and the GMC Savana. These options have their differences, but for the most part, they emphasize the utility of space and capacity over extra frills. 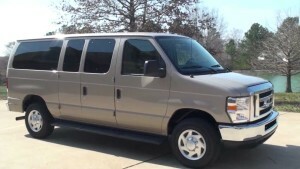 If you need a bigger van, check out our 16 person rental options. It is worth noting that there are various laws and restrictions imposed by the government as well as the rental companies themselves. Most national rental companies require the age of the renter to be at least 25; this is because of the additional costs and risks associated with younger drivers that the rental company takes on by allowing a driver to rent such a large passenger vehicle. Even companies with lower age limits impose heavy additional fees to offset the potential risks. If you are over the age limit and decide to go forward with renting a passenger van, you should visit the website of any major car rental company where you can make a reservation online. Depending on the company, most have many convenient locations across the U.S., especially in metropolitan areas and airports where you can easily visit to pick up your rented passenger van after you’ve made your reservation online, via phone, or in person. There may be other restrictions depending on your circumstances. Some states have imposed limits on using the passenger vans to transport public school students out of safety concerns for children. Other organizations have set guidelines as to whether or not members can use passenger vans for official activities. For example, Boy Scouts do not allow large passenger vans made before 2005 to be used for programs and activities. Twelve passenger vans vary somewhat based on which company and model that customers choose. Some vans have more storage than others, and several companies allow customers to choose how much storage customers need to make the car rental experience more comfortable. Many twelve passenger vans also include CD players and radios. Twelve passenger vans are generally a great choice for long trips for larger families or groups of friends because they are much more spacious than minivans, which means they are more comfortable for long journeys. Twelve passenger vans are more expensive to rent than most cars; many cost around $200 a day to rent. However, these vans also offer a huge amount of space and would be perfect for carpooling. Many companies will expect customers to make a deposit when customers rent a car, and most will provide customers with the option of purchasing insurance for the car. Customers must also purchase gas in order to keep the van running. Many websites allow customers to purchase coverage for emergency roadside assistance in case of accidents, breakdowns, or running out of gas. However, the overall rental process is normally simple, as vans can be picked up and dropped off at several locations, and because customers have many different companies to choose from.